DIRECTIONS: This cemetery is located on Gillespie Drive (formerly known as Gladd Road) 2.1 miles from the Franklin Falls bridge. It lies in both Essex and Franklin Counties. 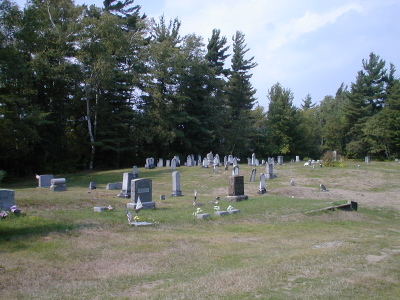 This cemetery was compiled by a member of the Saranac Lake Genealogical & Historical Society in April 1976 and entered by Ralph W. Bennett. 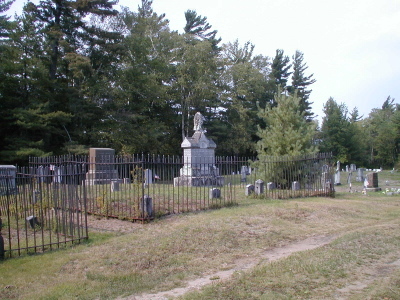 This cemetery is also known as Lincoln Brook Cemetery. It was verified and updated by Joyce M. Ranieri & Dorothy Horan on 8 September 2001. Franklin Falls Cemetery lies in both St. Armand (Essex County) and Franklin (Franklin County). The county line passes right through the cemetery. If you stand on the knoll facing the woods, the Ralph ARNOLD grave is the first grave which lies in Franklin County. Click here to see a photograph of the cemetery sign. George W. died Apr 6, 1871 age 56 yrs. Footstones: M. G., J. C., N.L.D. Malinda DIX Wife of Wallace GOODSPEED Died Mar. 19, 1893 Age 49 yrs. 2 mos. 8 ds. Co H 2 Reg N.Y.V.C. Francis O. 1842 - 1931 11th Vt. Reg. Geo died July 2 1897 52 yrs 4 mo 4 da Co C 118 Reg N.Y. Vol. Wm. H. died Jan 27, 1895 62 yrs. Lavina WATSON Wife of Wm. STOWELL died Mar 15, 1908 72 yrs. 9 mos. PRIVATE CO. M 2nd N.Y. CAV.